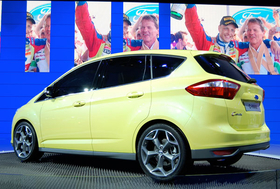 The C-Max features Ford's sporty, dynamic kinetic design language. FRANKFURT -- Ford Motor Co.'s new global design language for small and mid-sized cars and crossovers will evolve from the styling used on current European models. Martin Smith, Ford's European design chief, said the styling theme will be called "kinetic 2.0." Ford is harmonizing the design of its cars in markets across the world as it unifies development of compact and mid-sized cars globally to save money through efficiencies in engineering, purchasing and manufacturing. "We are developing an appropriate design language that will work all over the world," Smith said in an interview at the auto show here. Currently, Ford uses kinetic design in Europe and a styling it calls "red, white and bold" in North America. Usually, automakers have different car designs for different markets because they believe customers have different tastes in various parts of the globe. Smith said that with globalization and the Internet this no longer holds true. "A killer car will work everywhere," he said. Smith developed kinetic design after moving to Ford from Opel in 2004. The styling represents "energy in motion" and is aimed at giving Ford cars a sportier, more dynamic look. The latest Ford vehicle with kinetic design is the C-Max minivan unveiled in Frankfurt. The C-Max will go on sale in Europe starting next summer and in the United States in 2011. The C-Max is the first of a new generation of global C-segment cars that Ford will launch over the next several years. The new cars include the next-generation Ford Focus, which arrives in late 2010. Smith said specifically American vehicles such as the Taurus sedan and F-150 pickup will not become part of Ford's common global styling.